Master Chocolatier Fritz Knipschildt displays his signature intensity and attention to detail during The 2010 Clarke Chef Shootout where he won the judge's vote as champion. Clarke 2010 Chef Shoot Out competitors Master Chocolatier Fritz Knipschildt (Chocopologie) and Chef Matt Storch (Match) return to The Clarke Culinary Center in 2011 with new classes. Knipschildt won the judges vote for champion of the Shoot Out, while Storch won the popular vote that night. On Thursday, February 24, Fritz Knipschildt will offer “The Marriage of Desserts & Wine.” Knipschildt will work with his Chocopologie team to create three sumptuous world-class desserts and teach guests not only how to make these, but also how to pair them with wine that will take the decadence to a whole new level. The following week, on Thursday, March 3, Matt Storch will treat one dozen guests to a hands-on knife skills class. 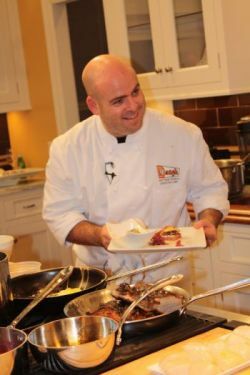 Participants will learn Storch’s knife techniques, as well as the type of equipment he purchases and how these tools are used at his award-winning restaurant Match. 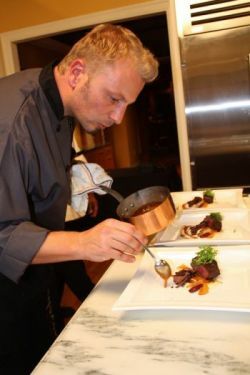 Chef Matt Storch presents one of his crowd-pleasing dishes during The 2010 Clarke Shootout in SoNo at The Clarke Culinary Center last fall. According to Clarke, The Culinary Center also offers gift certificates, which make a great Valentine’s Day, Birthday, Mother’s Day or anniversary gift. One call to the registration line will help you facilitate a gift certificate being sent to you or directly to your gift recipient so that they may select the class they would like to attend. This cooking school for home chefs is the result of 20 years of requests from customers. As the exclusive New England distributor of high-performance appliances from Sub-Zero, Wolf and Asko, Clarke’s award-winning showrooms provide an inspirational environment in which to house a culinary school. The Clarke Culinary Center has two locations, inside the Clarke showrooms in South Norwalk, CT and Milford, MA. Clarke’s South Norwalk Culinary Center has won a design award from Kitchen and Bath Business (KBB) magazine. The roster of chef-instructors is constantly growing and has included: PBS Emmy nominee Ming Tsai, Food Network regular and author Andy Husbands, creator of the most expensive truffle in the world Fritz Knipschildt, James Beard award-winner Jean-Louis Gerin, Chef and Co-owner for six-time “Best American Restaurant in Fairfield County” award-winner Matt Storch and many others. For more information, visit www.clarkecorp.com.